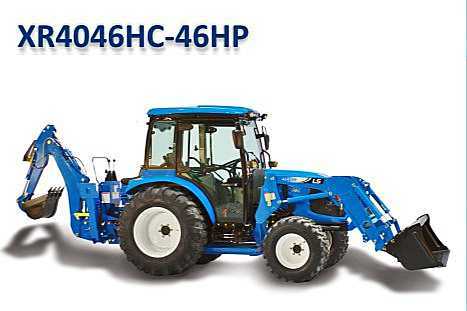 For maximum performance, ease of use and the comfort of climate controlled heavy duty compact 4WD cab tractor, the XR4046HC stands out from the crowd. The powerful 46 HP engine offers the performance you need with a 3 range hydrostatic transmission (HST) that provides precise control of your operating speed. Easily change speed and direction simply by using the forward or reverse pedals without clutching, moving a shuttle shifter or moving a gear lever. This allows you to easily steer with one hand while operating your loader or controlling your 3-point implement with the other hand. Nothing could be easier or more comfortable, especially when having to go back and forth a lot when doing dirt work. And when making a long run when mowing, simply set the cruise control. Combine this with the powerful, innovative, clean running TIER 4 engine and you have the perfect mix of performance and efficiency. The advanced engine technologies and emission reduction filters deliver a smoother, quieter ride that you will appreciate while idling or operating at high operating speeds. When it comes to heavy lifting, the XR4047HC has more front end loader lift capacity than competitive models, so you can work more efficiently. And it’s quick attach, skid steer compatible and comes standard with the grill guard. Frequent implement changes are made easier with extendable lower links and the standard two sets of rear remote valves allow you to quickly connect to hydraulically operated implements like backhoes, rakes, and wood splitters. Superior performance. More standard features. Extreme comfort. Maximum ease of use. Incredible value. That's the XR4046HC.